Senior pitcher Tyler Swiggart stands at the mound in a baseball game against VCU Friday. Baseball is fighting to secure a spot in the Atlantic 10 Championship this season, after clinching a postseason berth three years in a row. The Colonials (28-22, 12-9 A-10) fell 6–0 on Friday and 6–2 Saturday to VCU (31-21, 14-10 A-10) before taking the final game of the series 11-2 Sunday. GW has lost four of its last five games in conference play, dropping the team to seventh place in the league. The upcoming A-10 Championship – which is hosted on GW’s turf this year – admits the top seven teams. The Colonials lead the conference in total hits (511) and overall team batting average (.294). The team’s 315 total runs scored is good for second in the conference. On Friday, the Colonials connected on only one hit – the team’s worst hitting performance this season – before collecting 16 hits and 11 runs Sunday. With one more regular season series left, head coach Gregg Ritchie said the team needs to hit and pitch more strikes like they did Sunday to remain in postseason play. The Colonials came out cold in a 6–0 loss to the Rams (30–20, 12–10) in Friday’s series opener. 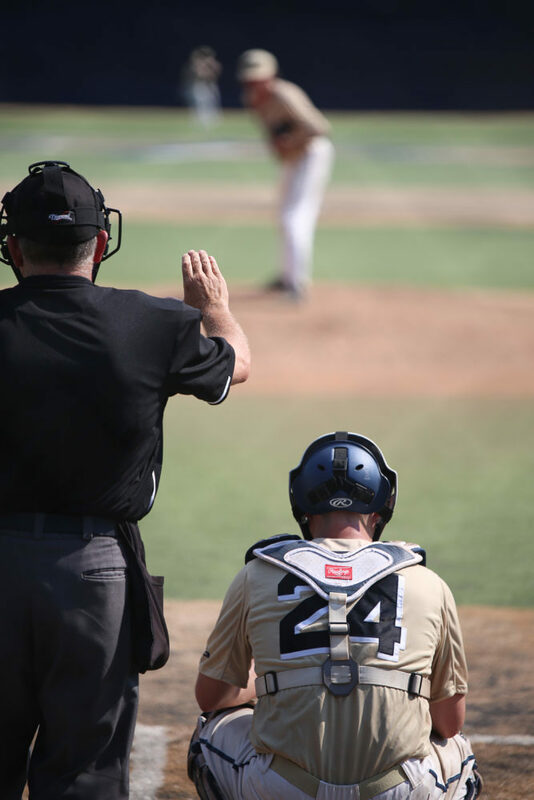 Senior catcher Brandon Chapman waits for a pitch behind home plate in a baseball game against VCU Friday. GW’s offense managed just one hit all afternoon against junior right-hander Jack Alkire, who was sharp on the mound for VCU. Over five scoreless innings, Alkire threw 48 of 64 pitches for strikes and punched out five Colonials, lowering his ERA to 2.61. Toeing the rubber for the Colonials was sophomore right-hander Jaret Edwards, who appeared erratic in his 10th start of the season. The trouble began in the second inning, when he walked two batters and was charged with a balk. A two-run double by junior shortstop Zac Ching then cleared the bases and put GW in an early 2–0 hole. 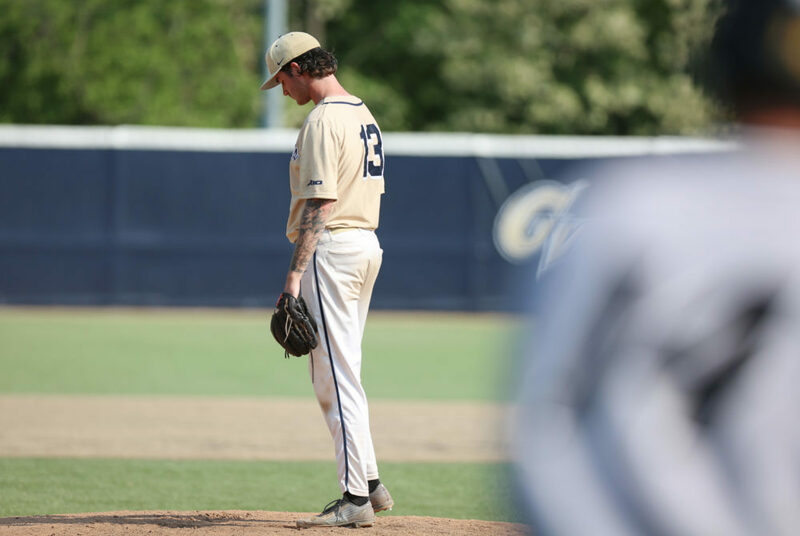 Edwards, who tossed a complete-game one-hitter in a 1–0 win against George Mason last week, lasted only four innings against the patient VCU lineup. Edwards ended up walking four batters and was charged with six earned runs. After a shutout third frame, it all fell apart for Edwards in the fourth. Senior designated hitter Mitchel Lacey deposited a 0–1 pitch over the wall to provide an insurance run. Two walks and one out later, sophomore catcher Josh Simon hit a moonshot to the same spot as Lacey – this time scoring three runs and putting his team ahead 6–0 to seal the deal. Long-reliever Tyler Swiggart came in and gave the Colonials five shutout innings of five-hit ball, but GW’s bats struggled to make hard contact all day. Led by junior Benjamin Dum and sophomore Hayden Moore, the VCU bullpen kept the Colonials hitless after the fifth inning. 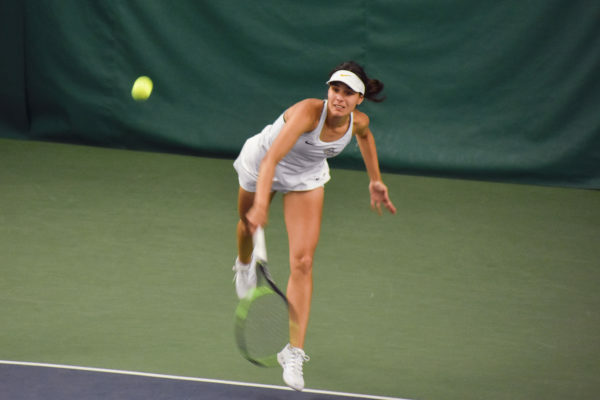 GW’s 6–2 loss to VCU Saturday afternoon extended the Colonials’ losing streak to four games. 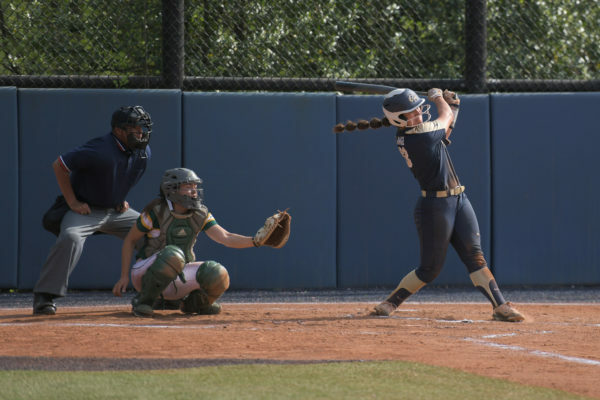 The Colonials adjusted their batting approach at the plate, looking to keep the ball fast and low to the ground after connecting on just one hit against the Rams Friday afternoon. Despite improving to eight hits in the game, Ritchie said the entire batting order didn’t adopt the new approach, leading to another tough day at the plate for GW. Senior outfielder Mark Osis went 3-for-4 from the plate to lead the offense, and the Colonials’ pitching staff combined for 11 hits and six strikeouts. Junior pitcher Nathan Woods started the game on the mound for the Colonials and held the Rams to one hit through three innings of work. A shaky top of the third inning by Woods saw a wild pitch, advanced runners to second and third, and a hit batter loaded the bases. Woods worked himself out of the jam, but started the top of the fourth inning walking two batters and hitting another to load the bases again with no outs. “I was breezing through the first three and then just came out for that fourth and I just lost the feel for my fastball, which really hurt me,” Woods said. Woods was relieved by junior pitcher Pat Knight with bases loaded and no outs in the top of the fourth and ended the contest allowing no runs. The Rams capitalized on loaded bases, knocking two back-to-back singles to send the Rams over the plate to take a 2-0 lead. The Colonials answered back in the bottom of the fourth, spurred by a leadoff single by Metz. A single by Osis put Metz in scoring position at third base. Metz stole home to put GW on the scoreboard 2-1. Junior utility player Dominic D’Alessandro nailed a line drive deep down the left field line for a triple, sending sophomore infielder Nate Fassnacht over the plate and tying the game 2-2. The score stayed knotted through the fifth, with the Colonials going three up, three down in the bottom of the inning. The game got away from the Colonials in the top of the seventh inning. VCU’s Lacey hit a two-run home run into right field to clear the bases and put the Rams up 5-2 with no outs. A run batted in by Ching upped VCU’s lead 6-2, the final score of the game. Powered by an explosive offensive performance, the Colonials took the final game of the series 11-2. In their final regular season game at home, the seniors of the squad carried the team offensively. Osis, Metz, outfielder Matt Cosentino and catcher Brandon Chapman combined for seven RBIs and five runs. Ritchie highlighted Chapman’s walk after a 10-pitch at-bat in the second inning as the turning point for the series’ momentum. “That at-bat will never stand out in a scorebook. But that at-bat got this dugout fired up,” Ritchie said. After Chapman got on base, senior utility player Isaiah Pasteur hit a triple that put the Colonials on top 3-0. Osis broke the game open with a two-run home run in the following inning. Pasteur, who leads the team offensively in batting average, hits, runs scored and home runs, also took the mound for GW for seven innings. Osis hit 3-for-4 on the day, recording two doubles in addition to the home run and five RBIs. D’Alessandro, who went 3-for-5 from the plate with an RBI, said the team’s offense was the key difference in the only win of the weekend. The Colonials will begin their final series of the season against Saint Louis Thursday. First pitch is scheduled for 6 p.m. CT.